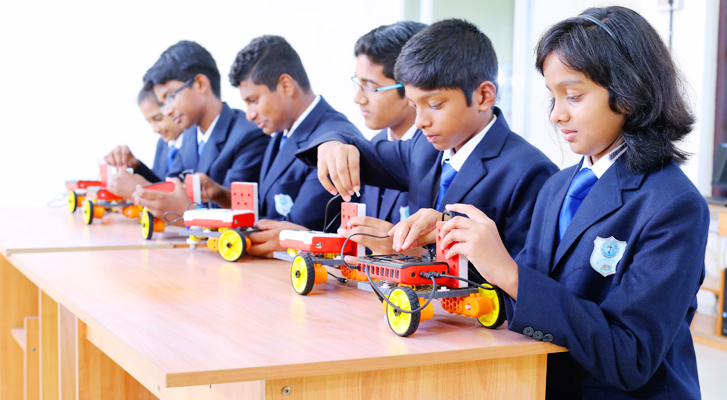 ROBOX is a self paced experiential learning package which helps students to learn STEM (Science, Technology, and Engineering & Mathematics) concepts in a practical, hand on & experiential approach. The proposed program can provide a strong platform for the young students to learn academic concepts through experiential learning on ROBOX kits, apart from their theoretical classes. The program will also serve as a wonderful opportunity for the young students to identify their areas of interest, develop, nurture & choose their future course of study accordingly. The analytics & assessment systems of the program will give an opportunity to the teachers & parents to guide the students in the right path. The vision of the program is to establish a fun, joyful & vibrant atmosphere in the classes and bring out the innovative skills in the young students. ROBOX is well supported by detailed lesson plans, video tutorials, a 3D video game like animation driven programming simulator & software, assessment worksheets for the students to work on. Students will be subjected to a unique way of learning as part of this program. Let’s make your kid Join the ROBOX community Now!